Born in Long Beach, CA, Lee Puffer grew up in Coastal Massachusetts and Maine, Mexico, Venezuela, and the shores of Lake Erie in Western New York. Puffer began her career after graduating with Honors from the Massachusetts College of Art with a BFA from the Studio for Interrelated Media in 1992, working with Tony Oursler among others. In 2004 Puffer enrolled in the Graduate program at San Diego State University, earning an MFA in 2007 with an emphasis of Ceramics. Her nomadic background manifests itself in sculpture made with a distinct sense of place. Her background as a multimedia artist lends her sculpture and sculptural installations immediacy and a contemporary sensibility. Puffer creates life-sized figurative and kinetic sculpture and installation which offer cultural critique through personal and controversial imagery often appropriating and re-contextualizing images and ideas from popular culture. 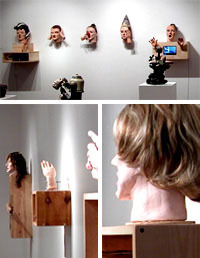 She has exhibited at The Institute of Contemporary Art Boston, The American Museum of Ceramic Art, and The Women’s Museum of California among others. She is currently on faculty at Palomar College in San Marcos, California.